Do you want to learn how to glaze cabinets? I have been doing just that for over 15 years in my contracting business, Rekindled Spaces. 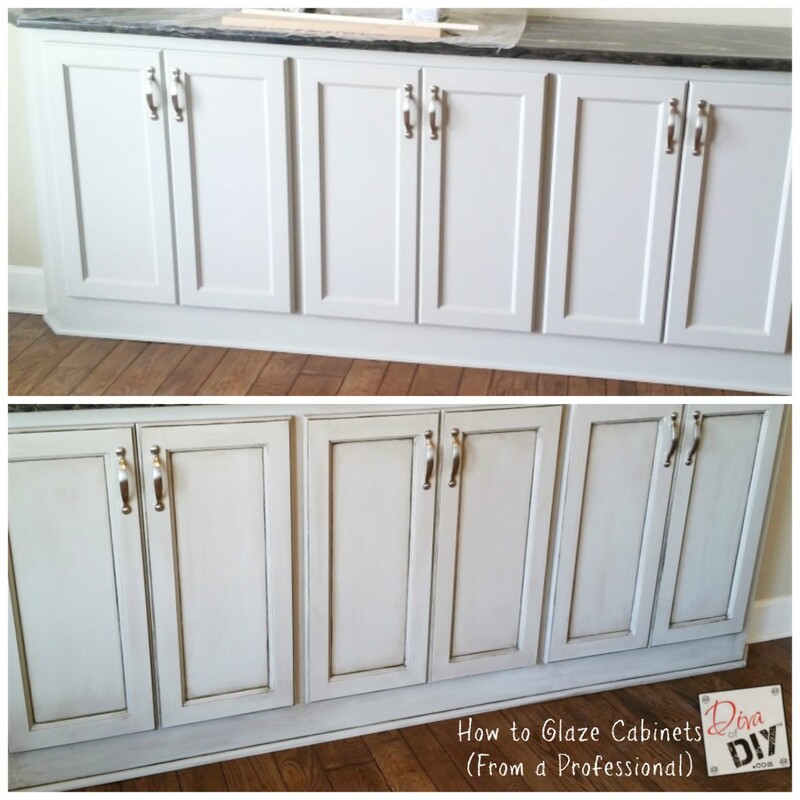 Let me show you how to get the look of glazed cabinets in your own home! I love the look of glazed cabinets. It adds much-needed character to standard cabinets. 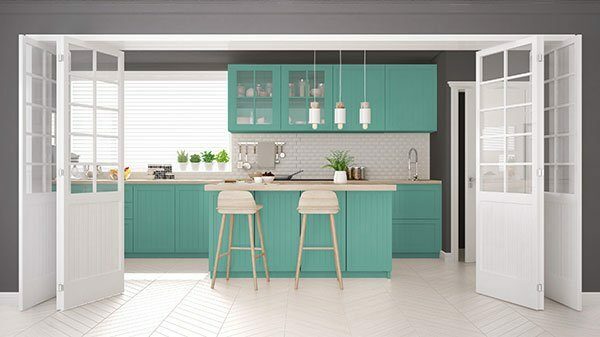 Whether you have an existing home that needs updating or a brand new home that needs some personality, glazing your cabinets may be the answer. I would say about 75% of my business is cabinet and furniture finishes. I will also say that no one has ever disappointed with the outcome. This particular home is brand new. 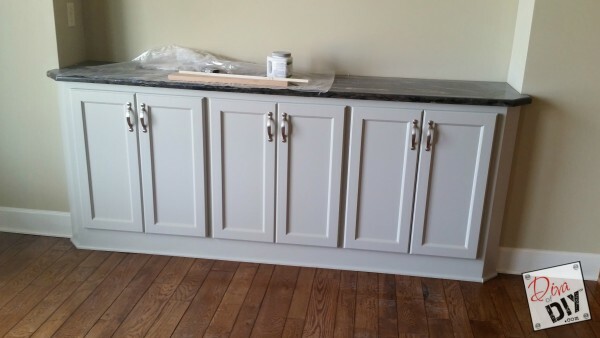 The cabinet doors have a shaker style so they have very little character…that’s where I come in! The image above is what the cabinet looked like when painters were finished with it. It was base-coated in Sherwin Williams Dorian Gray. 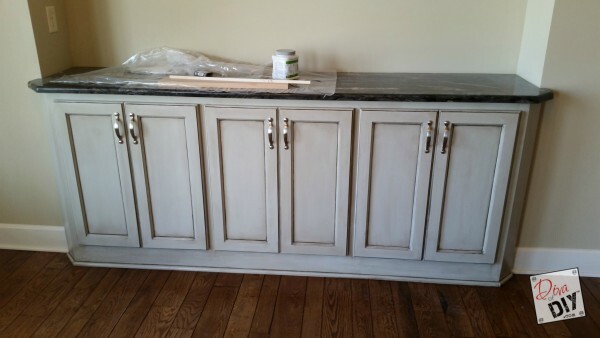 It’s a good paint job but the color did nothing for the granite…it needed to be warmed up with cabinet glaze. In a large container with a lid, mix 1 part of the Van Dyke Glazing Creme Color into 4 parts of the Modern Masters Furniture Glazing Creme. Make sure you mix up more than enough to do the entire project. 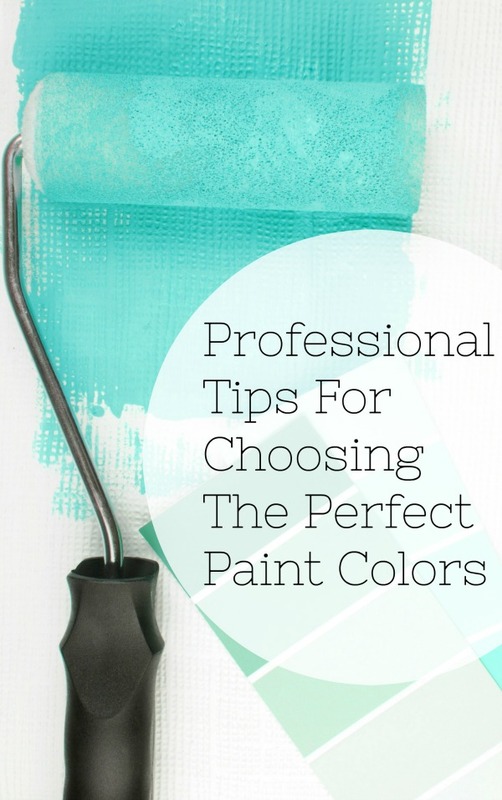 You don’t want to make another batch because mixing the same color probably won’t happen! I like to pour mine into a paint tray because it’s easier to dip the lambswool pad into it. 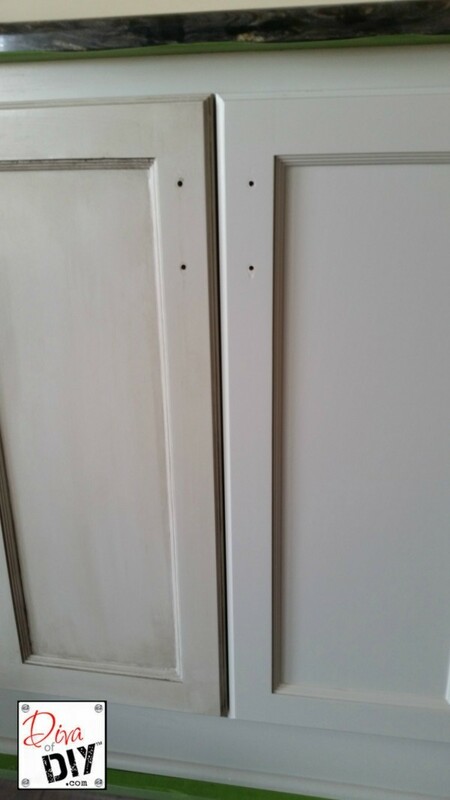 Prep the cabinet by removing the hardware and taping off the areas you want to keep clean. I always tape and plastic off the floor and the wall adjacent to the cabinet. I usually remove the cabinet doors to glaze but… would you believe the painters painted the cabinet with the doors on? They painted the hinges and all so they were fused on meaning…they weren’t coming off without a fight! Here is a section where I glazed the door on the left but not the one on the right so you could see the difference. Now keep in mind, it hasn’t been detailed in the creases yet but it warms up the cool gray tone. For the detail: Mix a small batch of concentrated glaze. 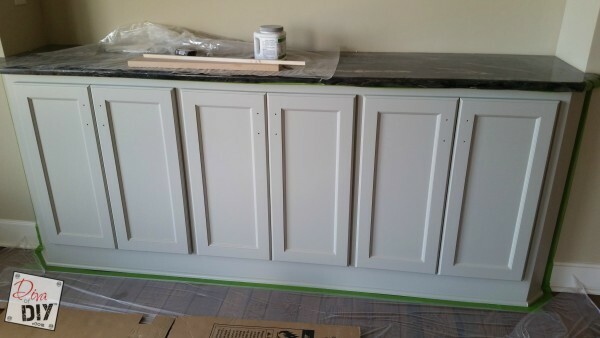 I usually mix 1 part glazing creme color into 2 parts Furniture & Cabinetry Glazing Cream. Now the cabinet has been detailed in the creases with a concentrated mixture of Van Dyke glaze. And here is the finished glazed cabinet. Now it looks like a furniture piece instead of a builder grade cabinet. I love the look of the glazed cabinets, it really bumps up the look to a new level. Thanks for posting. Hello from Busy Monday. The glazing really gives a great look and character to these cabinets. I love finding new ways to refinish cabinets and other furniture. 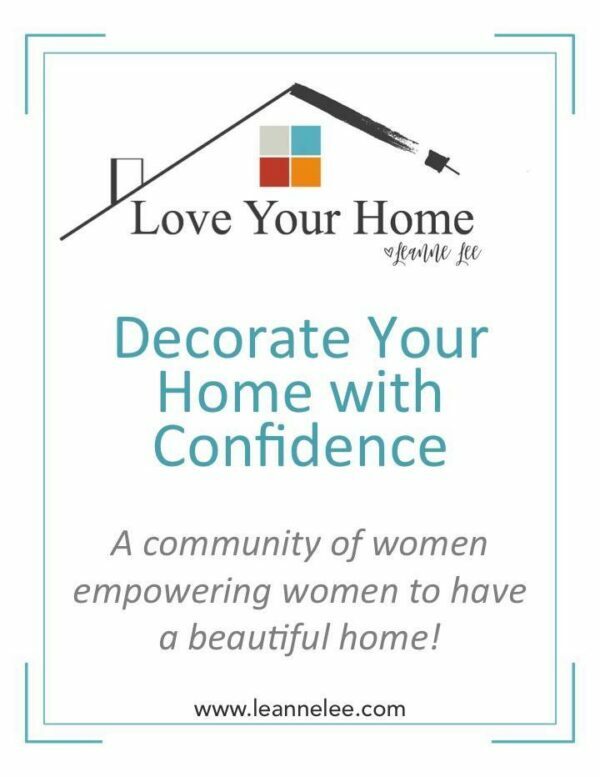 Thanks for joining us at the #HomeMattersParty and I hope you'll link up with us again next week! That looks great. I didn't look too hare either. Sure makes them look richer. Thanks for sharing. Thank you so much Brooke! Looks fabulous! Can this technique be used on formica? The technique yes but the formica will need to be prepped correctly for anything to stick to it. Wondering if these products can be used on exterior doors...? Sweet web site, super design, really clean and utilise friendly. Thanks Laurie! I hope you visit often!